This postcard, the only one of its type I have been able to find, was unused. The date is uncertain, but the Union National Bank building in the background on the left, was built in 1911, and judging by the vehicles and wardrobes visible, could not have been much after this date. Automobiles would have been in evidence after World War I in about 1918. "Preston Avenue had one of the city's largest and most popular eating establishments. Cafe Sauter, 901-907 Preston had a family dining room, delicatessen, imported liquors, fancy groceries and a fish and meat market." This stereopair is clearly taken at almost exactly the same moment as the above postcard. Cafe Sauter is on the left, and interestingly, the cart parked at the curb looks to be the same in both views. A man with a white shirt and black tie may be the same, and what I take to be a policeman is again positioned in the middle of the intersection, perhaps to direct traffic. Visible in the background on the left is the Kiam Building, and on the left the Scanlan Building and beyond, the Paul Building, and the Stewart Building, all to soon become part of this archive of Houston History. 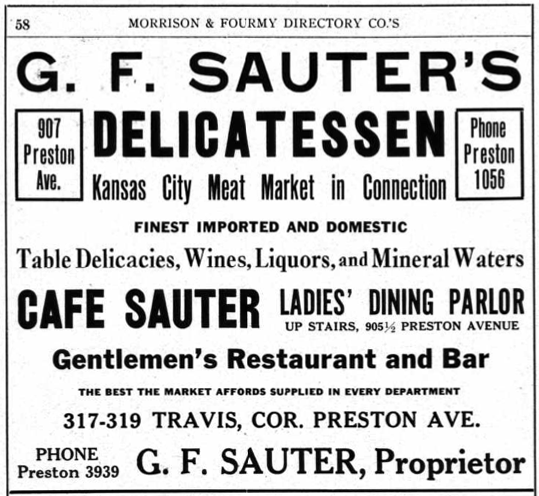 The proprietor of Sauter's Cafe was Gustav F. Sauter, whose residence was 1020 Jackson Street, a location now a part of the open areas of Discovery Green. Gustav was born 24 April 1857 in Germany, immigrated to America in 1878. In about 1881 he married Wilhelmina Dorothea Lippstreu, daughter of Friedrich Lippstreu (1823 - 1893) and Friedricke Schmock (1821 - 1903). The Lippstreu family came from Holzhausen, Provinz Brandenberg, Prussia, Germany, to Harris County in 1854. Wilhelmina was born 27 November 1859 in Harris County, TX. Wilhelmina and Gustav had son Frederick Gustav (1884 - 1965) and a daughter Pauline L. (1889 - 1970) in Harris County, who married George Alfred Ross (1881 - ); she died in Los Angeles, CA and is buried in Washington Cemetery. George Alfred Russ was born January 19, 1891 in California and was working as an accountant for Universal Shipyards in Galena in 1918. In 1920 the Gus and Wilhelmina were living at the 1020 Jackson with their daughter Pauline Russ and her husband, and 2 grandchildren: Henry G. Schmidt (18) and Frederick C. (16) and three lodgers. By 1930 Pauline was divorced and back living with just her father and mother. Gustav died 5 January 1935 in Harris County, and is buried in Washington Cemetery, a German cemetery adjacent to Glenwood Cemetery on Washington Avenue. Wilhelmina died 13 November 1936 and in buried in the Lippstreu - Sauter family plot marked with a grand obelisque (Lots 73, 115). Houston Census of 1920, Gus F. Sauter, head of household, 1020 Jackson, ED 48, Sheet 5B, 5 January 1920. Houston Census of 1930, Gustave F. Sauter, head of household, 1100 Jackson Boulevard, ED 101-115, Sheet 16A, p. 214, 11 April 1930. Find A Grave Memorials: # 58580373, # 58572829, # 58505503, # 59030696. Ancestry.com: ZBownds / Derrick Family Tree. U.S., World War I Draft Registration Cards, 1917-1918 for George Alfred Russ.